ROAD TOWN, Tortola, VI - United Kingdom (UK) Foreign Office Minister for the Overseas Territories Lord Tariq Ahmad of Wimbledon will visit the Virgin Islands between July 31, 2018 and August 1, 2018 to discuss hurricane preparedness, and view progress on recovery. This was disclosed in a press release issued on July 27, 2018, by the Government Information Service (GIS), which noted that as part of his two-day visit, the Minister and Premier and Minister of Finance Dr. the Honourable D. Orlando Smith, OBE will visit a number of public sites affected by last year’s hurricanes. The press release said Lord Ahmad will also be updated on the how the UK’s support is helping recovery efforts, and will officially hand over the new purpose-built temporary Court House to the Government. This court house will allow the Supreme Court and Magistrates’ Court to function fully while a permanent building is constructed. According to GIS, Lord Ahmad will also visit RFA Mounts Bay which will remain in the region throughout the hurricane season to provide rapid assistance to islands if needed. He will meet with the board of the Recovery and Development Agency to be updated on their progress and efforts to deliver the six month accelerated plan ahead of endorsement of the longer term Recovery and Development Plan by the House of Assembly. 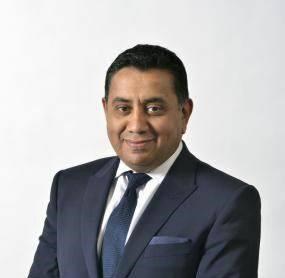 Lord Ahmad will also seek to address concerns about the UK’s Sanctions and Anti-Money Laundering Act when he meets with Premier Smith and the Cabinet. He will also meet with members of the financial services industry, business and tourism representatives. What hurricane, let's talk money but not n the hands off ndp. Please no! Maybe he's going to open a Falafel King restaurant. Fit right in.